In a future where minds can be transferred from body to body, your body is a commodity – whether you like it or not. Five years ago, Florian Bassot (Alexis Loret) was on a holiday with his wife and children when he got into difficulties while taking a swim. He’s been in a coma ever since. Now he’s woken up in a medical room, only to see his own corpse staring at him. He doesn’t know it yet, but while he’s been out, society has developed the technology to transfer one person’s mind into another person’s body, and now he’s living in what used to be Sylvain Bernard (Arieh Worthalter), a cop recently taken to hospital after being shot on the job. This might seem like good news, but there’s a catch: transferring minds is illegal, and Bernard is a captain in B.A.T.I., the task force assigned with tracking down those who illegally make the swap. Going by the creepy commercials playing everywhere, it seems that body theft is now a real problem – one that elements of the Church have leapt upon as a way to bring people back into the fold through fancy online confessionals. “One body, one life” is more than just a catchy catchphrase when it seems like the rich have turned into body snatchers. The good news for Florian is that his family haven’t moved on. In fact, his wife, Sophie (Toinette Laquière), is one of the people who organised his swap. So when he turns up at the family home, she should be able to bring him up to speed… just so long as the now clearly distressed and obviously confused “Transfer” patient doesn’t wander off again. It’s a paranoid world out there, firmly divided over the issue of Transfers and anyone acting even the slightest bit unusual is a prime suspect. One character even explains that, with only a few thousand transfer cases, there’s no reason for society to be so obsessed with them. It’s a spot-on parallel with today’s terrorism fears, and it’s this attention to social detail that makes Transfer feel chillingly plausible. The overt science-fiction elements are largely downplayed, with no jetpacks, no replicators and only the occasional glowing virtual keyboard on a desk. Even the Transfers themselves are portrayed at times more like a real-life version of identity theft than some existential attack on the very nature of what it means to be human. Now Florian has to pretend to be Sylvain, living a lie and unable to contact his children while he’s surrounded by the very people assigned to hunt him down. His situation makes for knife-edge viewing and the tension rarely lets up – Sylvain has a personal life, too, and the excuse that he lost his memory after his hospital stay is only going to hold up for so long. Like the best dystopian science fiction, it’s a world enough like ours for its flaws to be familiar… just taken to a level hopefully we’ll never see. 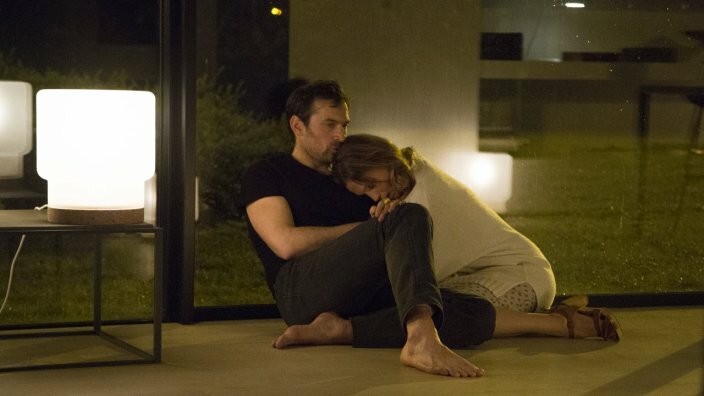 Knowing that we’re naturally going to be on the side of Florian / Sylvain, this series (which won Best French Series and Best Actor at the Séries Mania Festival) constantly throws up the worst-case scenarios around Transfers. There’s an elderly pianist who doesn’t think twice about stealing a younger body so her “talent” can live on; a rich CEO, who figures that, since he’s dying, he might as well transfer his mind into the body of his son – and his wife agrees. And that’s not counting the innocent-looking young girl who’s clearly not what she seems. The B.A.T.I.’s tactics might be brutal, but when every Transfer is a murderer and new, possibly eternal, life is on offer, the stakes couldn’t be higher. Perhaps the most interesting element in all this is the suggestion that the mind isn’t all there is to a person. When people transfer their minds into another body, sometimes they “revert” – become violent and paranoid as their old self re-emerges. Even those who remain more stable can find themselves taking on attributes of the person whose body they now inhabit. Florian was a quiet, thoughtful cabinetmaker who was devoted to his wife and children; Sylvain was something of a loose cannon, a hotshot cop who got off on excitement and danger. What happens to them when one personality is forced to fit inside the other’s body? This French series takes Agatha Christie’s much-loved murder mysteries and gives them a distinctly Gallic spin. An interview with the award-winning author about her book, 'In Other Worlds'. France’s latest sci-fi hit series owes a debt to the horrific futurescapes that came before it.